Don’t miss Glenn Greenwald, Pulitzer-Prize winning journalist, constitutional lawyer, and New York Times best-selling author, at PREX17 this September in Portland, Oregon. Our PREX17 headliner shares a preview of his take on law, privacy and the internet as a liberation tool. Journalist Glenn Greenwald is the featured keynote presenter at PREX17, the premier in-house ediscovery conference, this September in Portland. He’ll be on hand to discuss privacy in the age of technology and the resulting implications for ediscovery. Glenn graciously answered questions in advance of his presentation. Zapproved: Before moving into journalism, you were a litigator for 10 years starting at Wachtell Lipton before hanging your own shingle. Can you share with us what your practice area was and what challenges you experienced during the early days of electronic discovery? Glenn Greenwald: When I was at Wachtell, I litigated the highest-stakes securities fraud cases and corporate disputes. Once I left, particularly at the beginning of opening my own practice, I had to litigate everything that walked in the door — from petty disputes between neighbors to medical malpractice cases. But as my firm grew and became more stable, I was able to accept only those cases about which I was passionate, such as constitutional law and free speech cases, media defamation trials, and mass discrimination suits. At the time — in the late 1990s and into the 2000s — electronic discovery, and really the internet itself, were in their infancy in terms of governing law. People were already storing huge amounts of critical data digitally, but there was very little in the way of technological instruments or governing legal doctrine to guide the process or make it manageable. That meant many hours in conference rooms manually browsing through thousands of emails and documents in search of what was discoverable and interesting. Zapproved: You revealed the Snowden documents and other efforts to monitor communications to serve as a check on unconstitutional surveillance activities on US citizens. Was this a logical extension of your work as a constitutional lawyer and what advantage is there to working in the press — in the so-called “court of public opinion” — versus an actual courtroom? Greenwald: The work I’ve done as a journalist is absolutely an extension of the work I did as a litigator — both in terms of the substance of the law I practiced (constitutional cases) and the methods used to manage and make digestible large amounts of complex information. Being a litigator and a journalist both afford the opportunity to have an impact on public affairs. The difference is that, with rare exception, lawyers have an impact on the specific case on which they work, while journalists have a bit more of an opportunity to help shape political discourse and public awareness. Zapproved: With your Pulitzer-winning reporting at The Guardian and now at The Intercept, many consider you to be the global standard-bearer of the “fourth estate” by keeping governments in check. Do you think efforts like the General Data Protection Regulation in the EU will be effective in protecting privacy from governments and corporations? Greenwald: My top concern would be two-fold, both involving information security. The first would be how to protect my company’s digital data from theft, surveillance and other forms of intrusion from outside entities (whether foreign or domestic, state or non-state actors). The second, and related concern, would be how to balance the need for internal monitoring to prevent theft and other forms of espionage with the need (and value) of preserving privacy for the company’s employees. The balancing act required is similar to the one for government officials: how to serve legitimate security interests without running roughshod over privacy concerns. Zapproved: Since the mass adoption of the internet, we’ve seen that the rate of technological advancement continually outpaces strategies designed to manage online governance. Is there a viable solution? Greenwald: I’m not sure a solution is either viable or desirable. All of this depends upon one’s view of the internet. If one regards the internet as just like any other societal venue, then it is presumably important to find effective means of regulating, controlling and policing it. But if one subscribes to the original vision of the internet – as a unique tool for human liberation, equalization, and individualism – then calls for more stringent controls over how it’s “managed” and “governed” are anathema to its function. I tend to fall into the latter camp, though not with absolutism, and think that the balance has actually fallen too far in the direction of controlling the internet, to the point where it seems poised to be an unprecedented tool of control, surveillance and liberation rather than liberation. Zapproved: In the Internet of Things future, with billions of personal and business interconnected devices continually gathering information in public and private spheres, how do you envision the legal industry adapting to protect citizens and businesses? Greenwald: I don’t regard the legal framework as the first, or even most important, line of defense to preserve privacy. I view consumer pressure on big tech companies, along with development (and use) of encryption technologies, to hold the best promise for guarding against encroaching surveillance. But legal restrictions, and the legal industry, are vital: some of the most important pro-privacy protections have come from lawsuits and Constitution-based challenges to surveillance. States and private actors both owe legal duties not to intrude into private spheres, and enforcement of those legal protections will continue to be imperative. 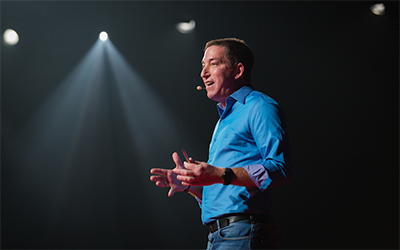 Glenn Greenwald’s featured keynote presentation “Secrets, Surveillance and Civil Liberties: Navigating the Boundary Layer Between Law and Technology in the Connected Society” will be delivered at PREX17 this September at the Portland Art Museum.